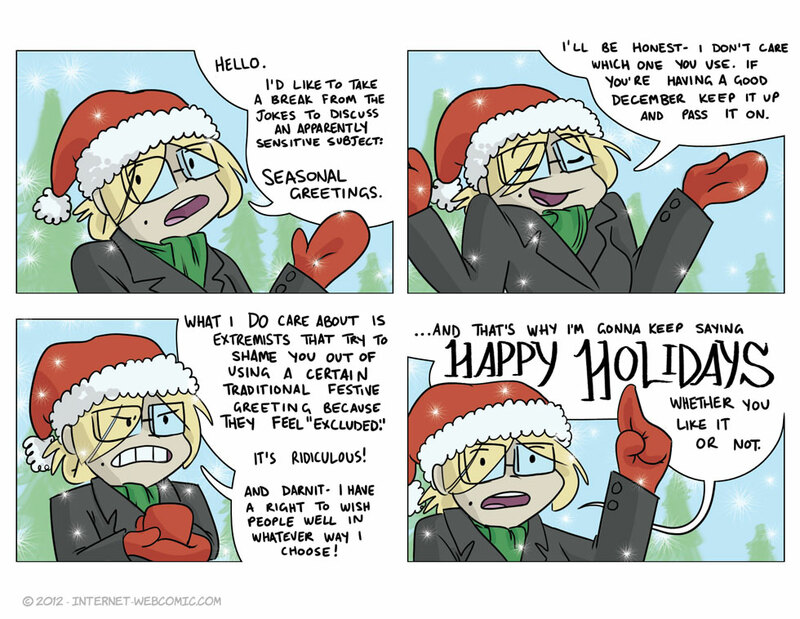 Fun fact: This comic is equally ridiculous with all seasonal greetings! Just be happy, people. True fact: If you become offended because someone sincerely wishes you well, you need to reevaluate yourself as a person. Merry Christmas. Job fact: If the person telling you what to use a specific seasonal greeting is paying you money to do it, that’s okay- as long as you’re on the clock. Comic fact: I did a guest comic for ARG today because he is sick and pitiful. Hopefully when I inevitably catch his bug at the holiday party or sketch jam he will show me the same mercy. It’s neat, you should read it…. unless you die at the sight of wieners because his website has some of those. Cooking fact: Mercilessly kneading and resting the dough overnight, as well as not overloading with toppings and cooking at a high temperature are the secrets to good pizza. Christmas fact: Enough people know about Saturnalia and Pagans that you can just make jokes about it or references to it instead of explaining it. If you want to find a fresh new December holiday to talk about, I suggest World Biodiversity Day (which is today!) or my birthday, which is traditionally celebrated by being too busy preparing for new year’s eve. Author fact: I don’t know anything about World Biodiversity Day, I just googled “December Holidays” to find something different because I’m tired of hearing about Saturnalia. Blog post fact: About halfway through I started writing these because I don’t want to go to bed. Holiday Greeting fact: I don’t really care whether people say “Merry Christmas”, “Happy holidays” or “Psh, whatever…”, I just respond in kind. That last one doesn’t happen often, though. …and an excellent solstice to you! Dawn of the Second Day: 48 hours Remain. In other news, MerHapJoyous ChrismaHannuKwanzika. I generally don’t like people wishing me well because they’ve got no reason to, so far as I can tell. It bothers me no matter what they say. But I’m the type of person who has a joy-buzzer on his door-knocker because people who *should* be at my door either have my RFID code and can open the door themselves or are smart enough to call me and have me open the door…. Well, here in Seattle it’s now close to noon on the 21st and I’m very disappointed with the lack of Armageddon. Oh well. At least I’m an Atheist. High-five, anyone? I never really paid much attention to doomsdays. Y2K was the only one that we had any reason to be afraid of due to it dealing with computers and, you know, fact. But I was 18, cocky, and didn’t care about it too much so I went home and watched the chaos ensue. I did the same with the rapture, and I threw a party a few days ago for the Mayan apocalypse. Anyone else have stupid family members that post bitchy .gifs to their FB’s about how employers whose customer’s might not be of any specific religious bent are actually making WAR on a holiday? Anyone else not give two shits about it? Nope, I don’t… why would you claim stupid people as family?